Regarding a ballot initiative calling for shooting gays put forth by a Southern California lawyer and for which qualifying signatures are now being gathered, i’ll suggest that it would be even easier to gather signatures for an initiative that proposed shooting lawyers. Had lunch last Friday with Richard at Just For You, a pleasant little lunch place on 22nd Street in Dogpatch where i had a delicious Hatch chile cheeseburger and admired Richard’s enormous pile of gorgeous french fries. Had to admire them again before he offered to share them so i could review them. They were as delicious as they were gorgeous. When i was waiting for the glue to dry on my Dead Drop installation, i walked half a block down to 449 Castro Street and had a hamburger at Sliders Diner, which i knew was excellent but had not eaten there in so long that i didn’t realize it was slightly better than Burgermeister. If you want a hamburger in the Castro, go there. Took Jeff to Sushi Zone, which was the first time i’d taken anyone there, but no surprise that he loved it. We both had miso soup and Sapporo. I ordered the stuffed Jalapeño and the Spicy Hamachi roll. He ordered the Baked Sea bass, Baked mussels, a delicious octopus and cucumber salad, and one of the rolls. Whew. We shared it all, so it was twice as much as i usually eat there, but it was excellent to try the sea bass, the mussels, and that salad because all three were superb. That place is a treasure. Last Wednesday i went to the Castro Farmers’ Market and took Marie of Rodin Farms a tiny jar of my pickled sugar snaps. She loved ’em, and she’s such a sweetheart that instead of hiding the jar immediately she offered tastes to those nearby. 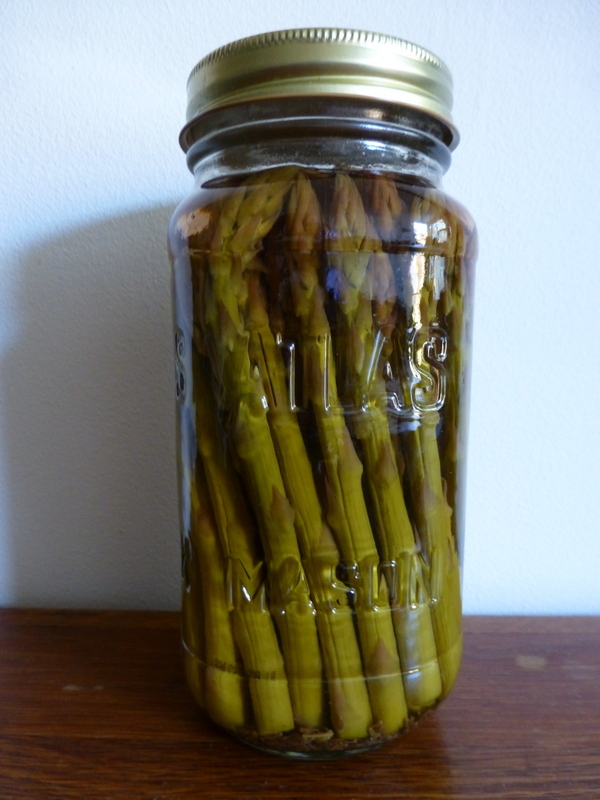 After we’d finished discussing the excellence of the beans, she mentioned that she’d recently had a jar of pickled asparagus and wondered if i ever pickled that. Asparagus! i wondered. And then realized that my favorite asparagus vendor was two stalls down. Thus this trial, which is awaiting her review next Wednesday. And now the bad news. Now that i’m only a block away from it since it’s at the corner of Market and Laguna in that fine Art Deco building, i went to the Orbit Room. I’m not into bars anymore, but since they offer pizza in the afternoons and evenings, i thought i’d give it a try. Don’t.